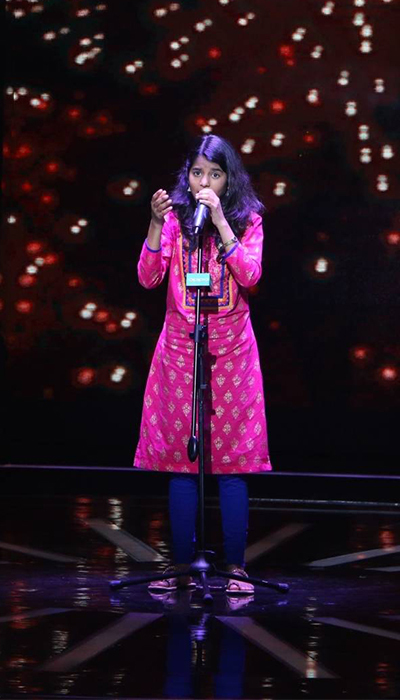 Our Nightingale Maithili Thakur proved that the talent will certainly get you in the door. Her assiduity and quest to reach the apex is a blueprint for the young nation builders. She surpassed various challenging levels to get the fame. Her singing reached to the National level and she was also the part of renowned event named Kala Utsav where she participated and gave incredible group performance which had media coverage too. Maithili got her break when the popular Universal Studios released her first and foremost Album – Yaarian. She covered three songs in the Album which proved to be exalted and remarkable. She left an indelible imprint when she performed in the most famous stand-up comedy and talk television series - The Kapil Sharma Show. She was being showered with blessings of Navjot Singh Sidhu after singing ‘Jo bheji thi duaa’ song and received Lava Mobile phone as a gift from Kapil Sharma. Maithili attained fame when she became the infamous contestant of the well-known live singing reality show ‘The Rising Star’ in which her performances were commendable and applaudable! She is, indeed, the notable alumni of BBIS.